Have I ever shown you mum's wedding gown? I er.... borrowed it for my wedding. Mum made it out of ribbon lace and bridal satin. It's a classic column gown with bell sleeves and a scoop neckline. Not gathered, not pouffy. And she made her little pillbox hat, which I thought was the cutest thing. These outdoor photos were taken in Singapore. 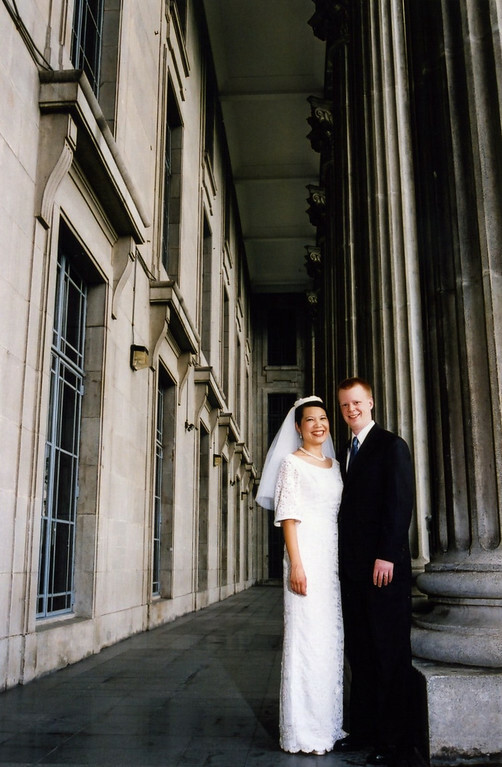 We were married in Minnesota, and we took a quick trip to Singapore to do the whole thing again there for our friends and the rest of our family. Our Singapore photographer was into architecture quite a bit, which explains the gorgeous backgrounds. My bouquet in these shots was some random bunch of dusty artificial flowers mum grabbed out of one of the vases in her house and wrapped in a doily - I'd completely forgotten I needed flowers. Also, I can't get over how proper and well-behaved I look in the photos. Couldn't be further from the truth. When I inherited the gown, it had to be let out A LOT. Mum worked on it in Singapore while I was living here in Minnesota - we did all the alterations by phone (so ridiculous). Her hand-beaded train was very chic, but very discolored over the years, so we had to make a new one. Now about this train - I still feel the strains of insanity when I think about it. It's one big rectangular piece of voile, right? Plain. Mum cut out all those lace flowers and stitched them by hand all over the middle of it. Then she took a plane with dad to come visit me, handed the train over, saying, "you've got better eyesight - you finish it". So I did. I stitched the border, in between writing assignments and my counseling internship in grad school. It probably was child's play to mum, after making stuff like that tablecloth. But it was a stretch for me, much as it was a nice distraction from school, since I prefer sewing-machining everything if I can. I don't think I've made anything since that has anywhere near that amount of hand-stitching. This is the back of the gown where the train begins. I must say that I haven't met anyone yet who can do fabric roses like mum. So that's my/mum's handmade gown. I'm hoping one (or all of) my girls wear it someday. I'll think of some tediously beautiful part of it to have them work on, so we can pass down the family tradition of sewing oneself into a stupor days before one's wedding. And I found a picture of me wearing a Chinese thing!! It is the most recent one I could find, even though it is eight years old. 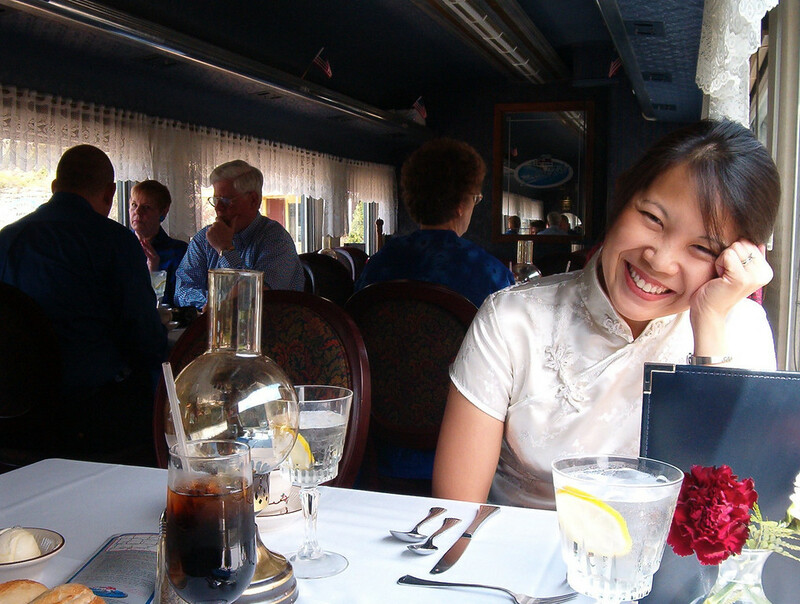 We were having dinner on a train, some months after our wedding. 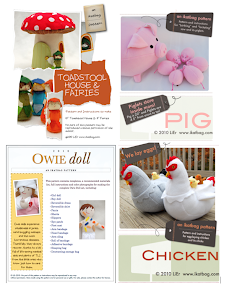 None of these are handmade - they were all bought in Singapore. But I want to make some soon, because I love mandarin collars, especially on actual Chinese suits. And then, yes, I'll do that frog button tutorial. I hope you enjoyed the photos! Some of you asked to see what else was in my Ethnic Clothes Closet - well, it's mostly stuff like this, and also one lurid neoprene wetsuit (I filed that under Miscellaneous). I miiiiiiiiiight have a photo of me in a saree and cornrows (long story) but that's even further back than 8 years ago. Like I said, I was..... different..... then. If I find it, I'll scan it and share it here. Gasp! All that handwork, it's amazing and so beautiful. I can't wait for your frog tutorial, I love the mandarin collars and Chinese detailing. Oh my, that gown is lovely! We wore jeans and t-shirts to our wedding. When we do the REAL wedding, I'm going to attempt to make my gown. That is a beautiful family tradition! And I LOVE that last outfit shown. 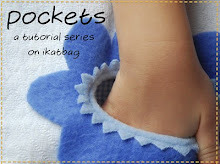 I'm going to attempt one for my little one! Lovely, lovely wedding dress - it looks fantastic on you and it must've looked equally awesome on your mum when she wore it. What a beautiful dress and what a beautiful moment to wear your mums dress with your own embellishments. Love it! I love that picture of you in your Cheongsam in the train it is so natural..and brings a smile to my face when I saw it. I have always been a follower of your blog but I don't comment much. 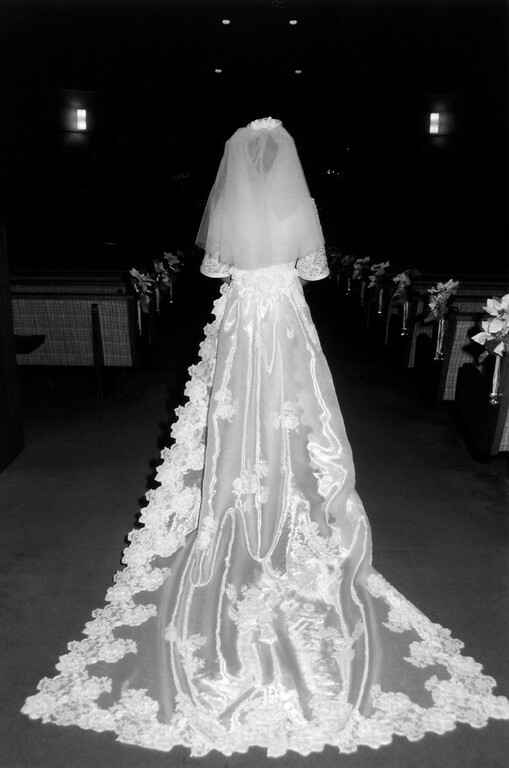 I love the wedding gown tradition..it's great if your girls can wear it one day. what a wonderful post. I truly enjoyed reading it. so nostalgic..and beautiful. 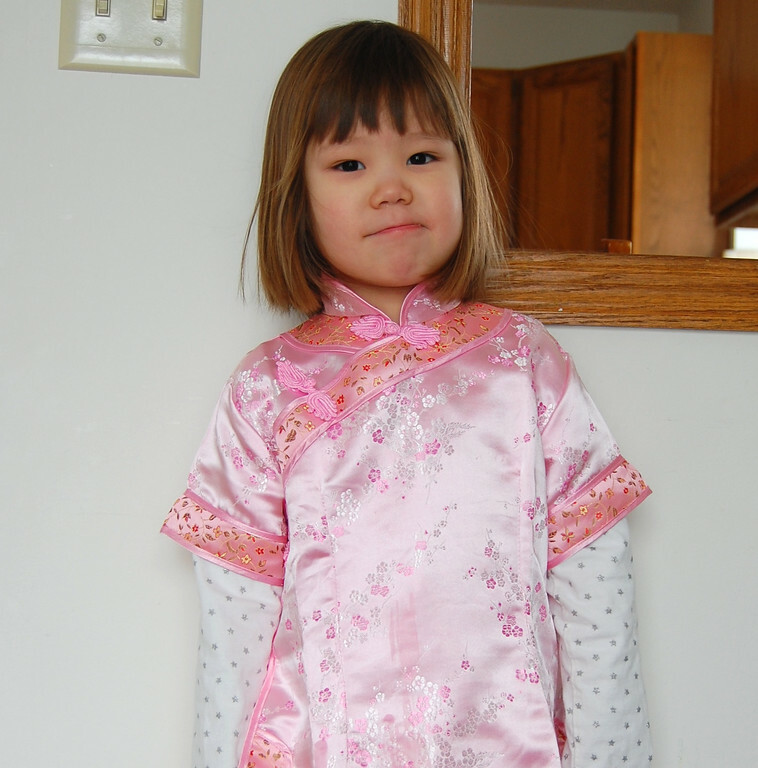 I hope you make a tutorial on how to make chinese cultural clothes with mandarin collars for a little girl soon because I have always wanted to make one for my little girl. Thanks for sharing these pictures! I've never seen a wedding dress like that, and it's really lovely! I can't believe that train was hand-stitched, and I've never seen such beautiful fabric flowers. Stunning. that dress is beautiful and i'm so jealous of that train it's exquisite!! Hello, I am an avid reader of your blog. 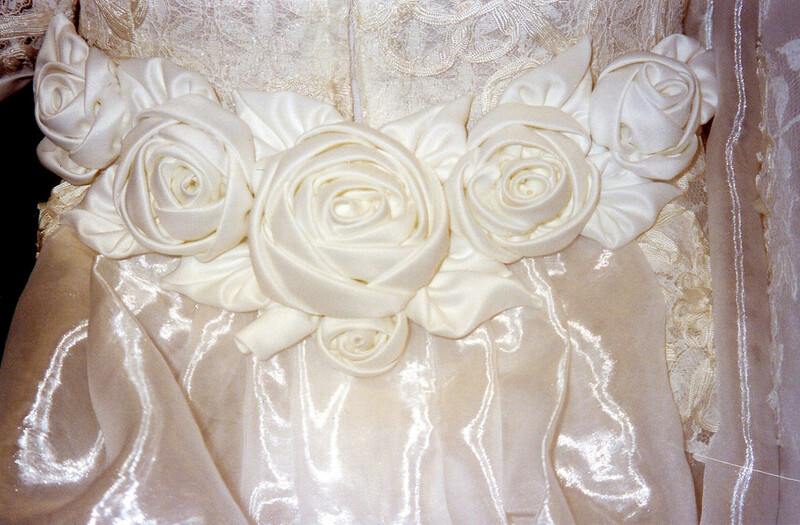 Your wedding gown is very beautiful and the handwork you and your mom put it - wow - it's just awesome!! 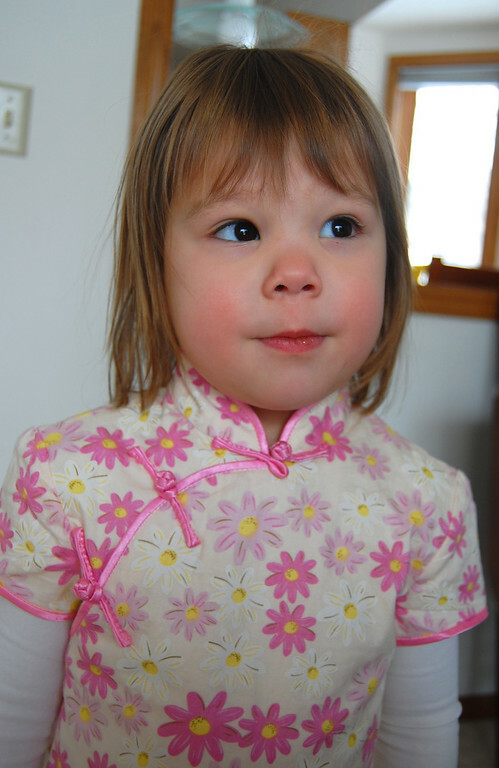 Your baby girl is so cute with her chinese dress. Oh, wow. That dress is unbelievable. Such a treasure. Thank you for showing it off! It's nice to see you, too! LiEr!!!! 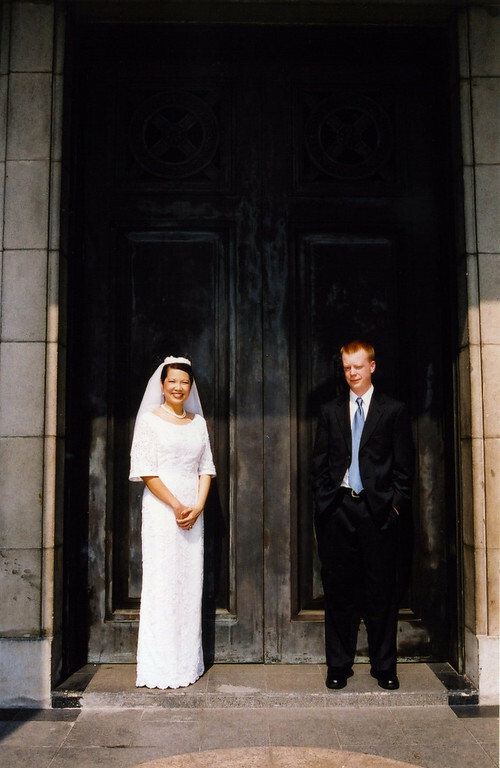 So beautiful - you and the gown and the story. How clever of your mum to make such a classic style. If your girls don't wear the gown (forget the handsewing idiocy), they are crazy. It's gorgeous and it has a great story. Maybe your mom could do a tutorial on her fabulous satin roses. I am dipping into making fabric flowers and I'm curious! Wow. And again Wow. And then come the close-ups of the train and the roses - WOW! I love all your photos, and the dress and train are fabulous!! Loved seeing these photos! And hearing the stories behind them. Reminded me of when I was getting married. My mum pulled out her wedding dress (that she'd made) and while it was fun to try it on, it wasn't going to work as a dress for me. I did however wear her veil, a beautiful, long, lace one from Brugges. And the photo of you on the train is just charming! Please keep that closet open!!! love everything about this post. Absolutely gorgeous wedding photos and wedding dress and I love the Chinese outfits. There is something about kids in Chinese outfits that makes me smile. I guess it's the colours, I'm not sure - (I live in walking distance to one of Toronto's Chinatowns, so I am fortunate to see great outfits on a daily basis). Wonder post. What a lovely pics. I like it. Thanks for the beautiful pics for sharing with us. I mean WOW, that dress is just unbelievable!!! AWESOME! Amazing! WOW WOW WOW!!!!!! Je viens de connaitre ton blog! Dommage "I don't speak english!!!" Y a -t-il une traduction en français ! Boy Shortalls on Made By Rae!